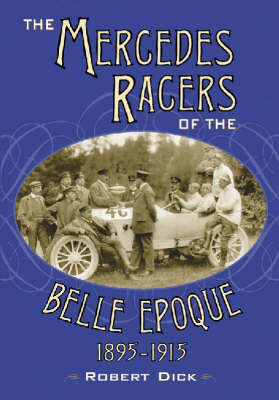 The history of the Mercedes provides the thread for this book that narrates the early history of automobile racing from the beginnings in 1895 until the First World War in 1915 when racing had to temporarily cease. The book focuses on the races themselves, the drivers and mechanics, the engineers in the background and the technical progress of the cars. Automobile had its origins in Paris, France at the Belle Epoque. French marques and the Automobile Club de France were dominating the scene and all the important races started from Paris. It was in 1901 that a foreign troublemaker emerged, the Mercedes. This German machine was to play a leading role; its career and evolution became an image of the whole period. In these early days, automobile racing gave invaluable assistance in improving the breed of the ordinary motorcar. The individuals who built and drove them laid the foundation of a new industry, conceived the modern, high-performance engine, and gave magic to a series of races, which drew hundreds and thousands of spectators and thrilled entire nations. Thoroughly illustrated, this volume answers the many particular questions and legends from this time in automobile history that are in need of clarification. Early chapters discuss the marketing of the original Diamler engines in France. Chapter Five explores the position and influence of the "Monsieur Mercedes," Emil Jellinek, and his favorite engineer, Wilhelm Maybach. Later chapters focus on the French boycott and the great crisis of 1909, the origins of the voiturette movement, the Mercedes and Benz successes in America, and the role of Ernest Henry in the development of the revolutionary Peugeot.